Whether you celebrate Easter or just want an excuse to dine out on a Sunday, there are a variety of offerings available on Sunday, April 21. Daisies will be offering a three-course, family-style brunch with a selection of pastries to start for $39. 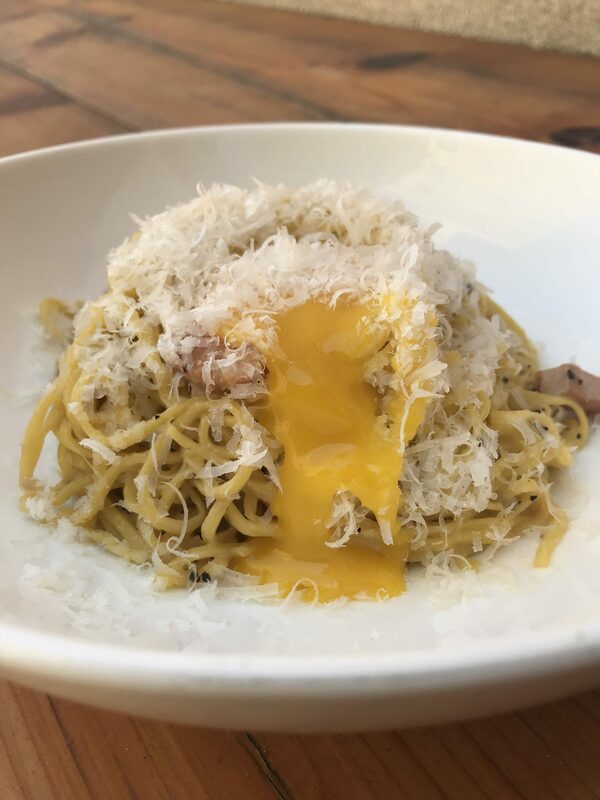 Dish options will include a classic carbonara with bacon, egg yolk, and black pepper and rhubarb pancakes to celebrate the coming of spring. Brunch will be served all day at Cafe Robey (7am-10pm) with dinner specials beginning at 5pm. Dinner specials will include beet salad, oysters, duck rillette, whole bass, spring pea succotash and more. Additionally, there will be an Easter Egg hunt in The Lounge for kids. Dos Urban Cantina will offer an Easter brunch buffet for $28/per person. The Heritage just welcomed new executive chef Rick Ohlemacher to the team and will slowly be rolling out a new brunch menu, which will be fully available starting Easter brunch. Brunch highlights include a hearth-smoked salmon platter, buttermilk biscuit and gravy, old school breakfast sandwich and buttermilk pancakes. Dinner highlights include bubbling shrimp and rack roasted oysters to start followed by hearth glazed lamb and the pig picnic for the table. 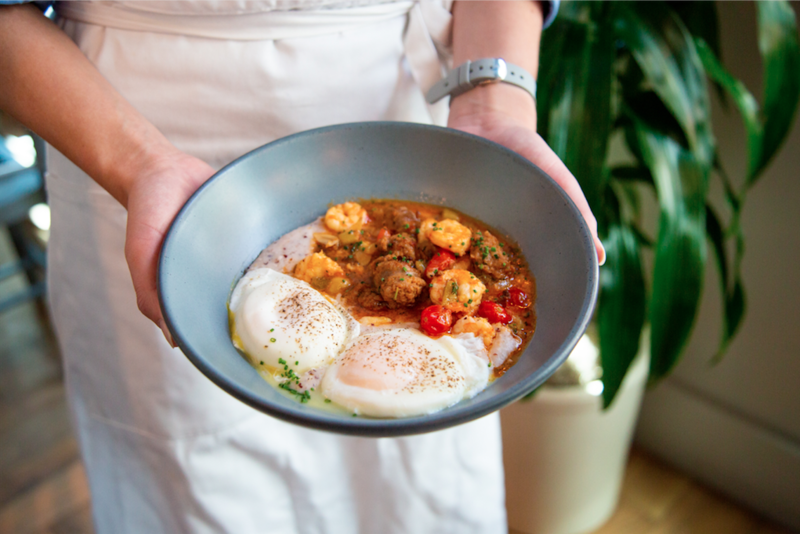 Treat you and your family to unique dishes like shrimp and grits, poached eggs with green shakshuka, chickpeas, queso fresco, creme fraiche and toast and gulf shrimp hushpuppies with honey pepper jam. To complement the brunch dishes, Ocean Prime Chicago will also serve signature cocktails including a Blood Orange Mimosa made with blood orange juice, simple syrup, Cointreau, and champagne and the restaurant’s Signature Bloody Mary made with Ocean Prime’s house made mix, choice of vodka, and jumbo shrimp. the Albert (228 E. Ontario), has unveiled a special Easter Brunch Menu. Curated by Executive Chef Larry Feldmeier, formerly of Sixteen, this menu will be available Sunday, April 21 from 11am to 3pm. Items on the menu include Green Eggs and Ham, Spring Lamb Benedict, and Carrot Cake. Additionally, the Albert will be offering a special Easter Egg(white) Cocktail with gin, mint, lemon, and egg white. Guests looking for something sweet aside from a chocolate bunny can choose between an Almond Cake, $11, with poached black plums, thyme, and a caramel drizzle, or a Strawberry Lemon Pie, $11, with a Tarragon crackle, and a pistachio crème anglaise. Z Bar, the globally inspired rooftop bar that debuted last June on The Peninsula Chicago hotel’s 6th floor, kicks off its new Champagne-focused brunch on Easter Sunday. 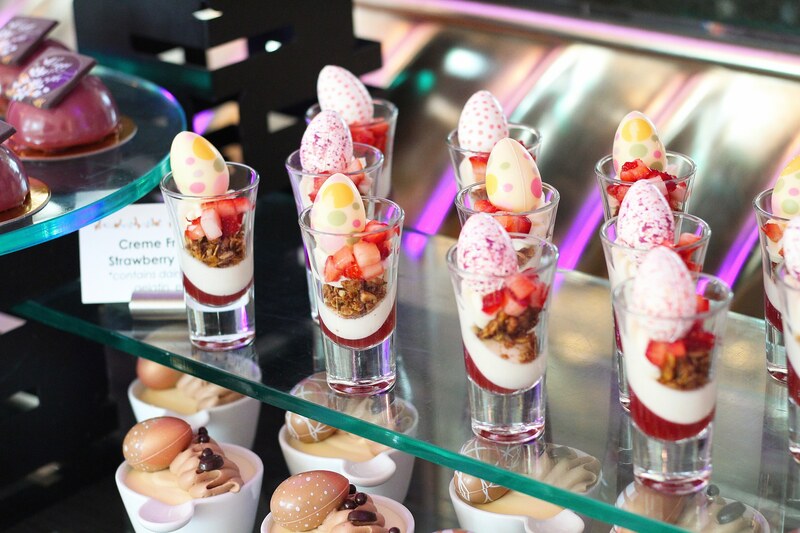 Guests might be tempted to start with a magnum of Champagne, served tableside, then proceed to the feature of the new brunch: a kir and mimosa bar set up in Z Bar’s main lounge. There, they can top off their sparkling wine drink with any number of accoutrements, including juices, liqueurs and fresh fruit garnishes. The beverage menu also will feature spritzes and specialty cocktails. On the food side, guests will enjoy classic brunch dishes with global flavors. Highlights include seasonal French toast, eggs Benedict and a playful spin on chicken and waffles. Easter brunch at Z Bar is from 11:00am to 3:00pm on April 21 and will run every Saturday and Sunday from 11:00am to 3:00pm thereafter. Reservations can be made by calling (312) 573-6888. The Lobby with its 20-foot picture windows is the sun-filled setting for the hotel’s Easter Brunch. Spanning The Lobby as well as the Avenues Ballroom, the all-day buffet features an array of savory and sweet dishes prepared by The Peninsula’s culinary team. There is something for every palate, from sashimi cut to order, to a “Vegetable Farm” with its colorfully composed salads, to a selection of pastries, tarts and other sweets. Interactive stations devoted to roasted meats, pasta, yakitori and dim sum showcase seasonal ingredients and global flavors. Raw bar selections include Alaskan King Crab, Jumbo Shrimp and more than a half-dozen freshly shucked oyster varieties. Guests are welcome to create their own beverage from a juice and smoothie bar, and children get their own buffet filled with favorites such as Macaroni Alfredo and Brownies. Entertainment for younger guests will include a balloon artist, a magician, an Easter egg hunt and a special visit from the Easter Bunny. In addition, guests will be treated to live music throughout the day courtesy of a string trio in The Lobby and a guitarist in Avenues. There will be three seatings in The Lobby between 10:00am and 5:00pm, and two seatings in the Avenues Ballroom between 10:30am and 2:00pm. The Lobby’s Easter Brunch is $225 for adults and $65 for children ages 5 to 12 (excluding tax, gratuity and alcoholic beverages). 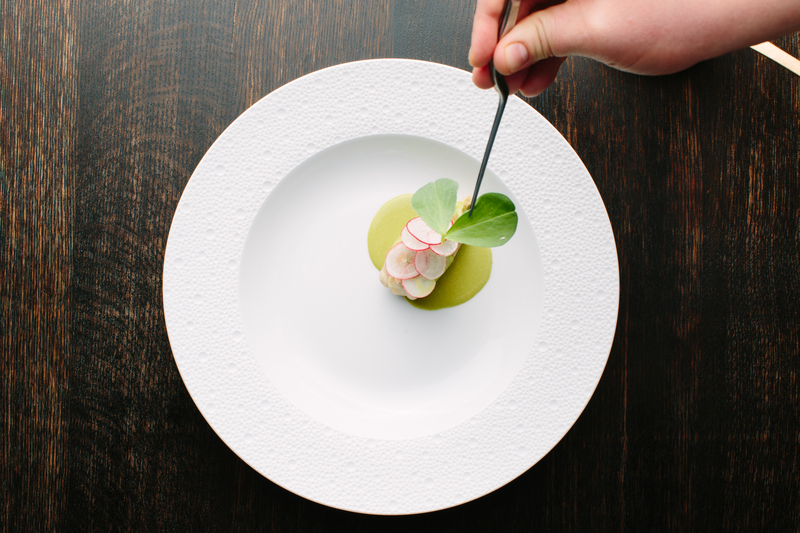 Reservations can be made by calling (312) 573-6685 or emailing diningpch@peninsula.com. The ground-level café on the corner of Superior and Rush Streets, will be open on Easter, serving its regular European-style, à la carte menu of pastries, salads, sandwiches and more. Pierrot Gourmet’s Sunday hours are 7:00am to 7:00pm. Shanghai Terrace at The Peninsula Chicago will be closed on Easter Sunday. Stan’s Donuts & Coffee (multiple Chicago area locations) is bringing back their Easter donut, which will be available from April 5 to Easter. The limited-time Peep donut will be topped with a Peep marshmallow and is sure to tame all your early Easter sweet cravings. Travelers and locals alike can step into the Atlantic Ballroom at the Radisson Blu Aqua Chicago (221 N Columbus Dr.) from 10 a.m. - 3 p.m. on Sunday, April 21 for a family-friendly Easter brunch featuring a full brunch buffet with garlic-crusted leg of lamb, an omelet station, snow crab legs, french toast, an Easter dessert display, complimentary Champagne pours and complimentary self-parking. Guests can even expect an Easter Bunny appearance. Brunch is $56 per adult, $22 per child 11+, $15 for children 3-10, and kids under 3 eat free. At Walton Street Kitchen + Bar (912 N State St.), diners can find all of their brunch favorites or try the Easter specials from the expansive two-level concept on Sunday, April 21. Specials include a scallion crepe with braised lamb, asparagus, English peas and a sunny side of egg ($21) and deviled eggs with bacon aioli, house pickles, and chives ($8), along with Walton Street’s usual brunch staples. If brunch isn’t your scene, hop over to mfk. (432 W Diversey Pkwy) for some seafood-focused specials. The Easter menu includes a smoked trout benedict ($16) with haricot verts, radish, toasted almonds and green goddess dressing, shrimp and grits ($24) with polenta and pickled fresnos, and a smoked rack of lamb with braised lentils ($36). mfk. is open early from 11 a.m. through 10 p.m.
Gemini (2075 N Lincoln Ave.), the Lincoln Park Ballyhoo Hospitality concept, will have a hearty Easter menu. Specials include a lamb shank hash ($15), as well as split pea soup ($11), leg of lamb with potatoes and housemade mint jelly ($38), wild Alaskan halibut ($36) and Southern Fried Chicken with country mashed potatoes, cheddar biscuits and housemade hot sauce ($26) served throughout the day. Open from 10 a.m. to 9 p.m.
Chicago’s newest Michelin starred restaurant Temporis (933 N Ashland Ave.) will be deviating from their evening menu to offer a three-course brunch for the first time ever. For $75 per person, guests can enjoy a 3-course menu with three options for each course. In keeping with Temporis’ adventurous offerings, guests can choose from dishes like Rabbit Encroute with rabbit brioche, mushroom sauce, fermented apricot jam, and pickled corn, and “Trail Mix,” a dessert featuring poached fruit, honey granola, almond milk, cinnamon, lemon balm, grapefruit shattered, brown butter cake, almonds. This special menu and brunch service will also be available for Mother's Day. Reservations are available from 11 a.m. to 2 p.m.
At La Sirena Clandestina (954 W Fulton Market), brunch returns for one-day-only on Easter, including offerings like breakfast empanadas with bacon, caramelized onions, fontina, maple syrup, and a sunny egg ($6), French Toasties with cashew butter, cachaca bananas foster, and whipped cream ($8), steak and eggs ($26), a Pao Benedict that shows off a braised lamb shoulder with poached eggs and aji amarillo hollandaise ($18) and more. Brunch starts at 10 a.m. to 3 p.m.
West Town’s Bar Biscay (1450 W. Chicago Ave.) is also opening early for a special Easter brunch with a Spanish treatment with dishes like a Basque burger with a fried egg, manchego, piperade, brioche and frites and a roasted leg of lamb with spring onions and salbitxada. Open early to serve brunch from 11 a.m. to 3 p.m.
For diners who are set on brunch but ready to skip Easter in favor of summer vibes, head to Beatnik (1604 W Chicago Ave). As part of their ongoing JetSet brunch series, which lets brunch-goers escape the Chicago winter to experience the music and cocktails of different tropical regions each weekend, Beatnik will host a "Flight To Teheran" themed brunch with Bonhomme music director Saam Hagshenas at the DJ booth spinning the musical styling of the Middle East. 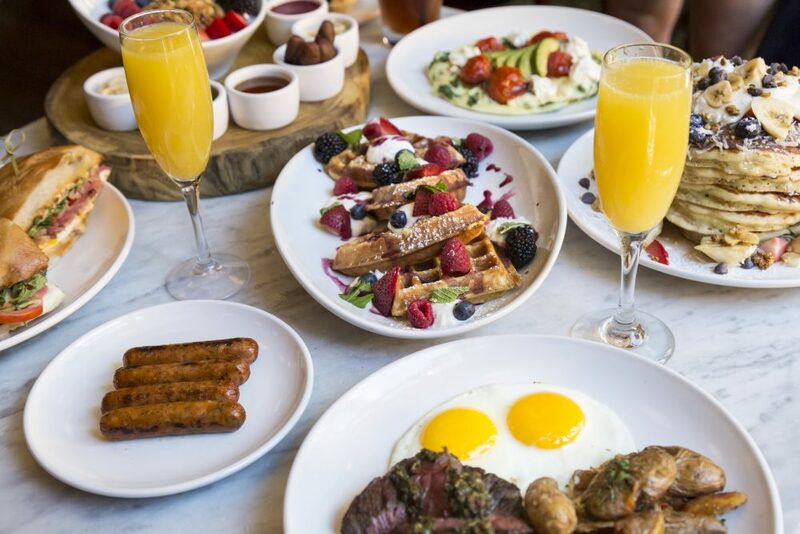 All of their usual brunch menu items will be available including shakshuka with duck eggs ($12) and a Spanish tortilla with uni ($14) as well as tropical-inspired specials, and 50% off all large format cocktails. 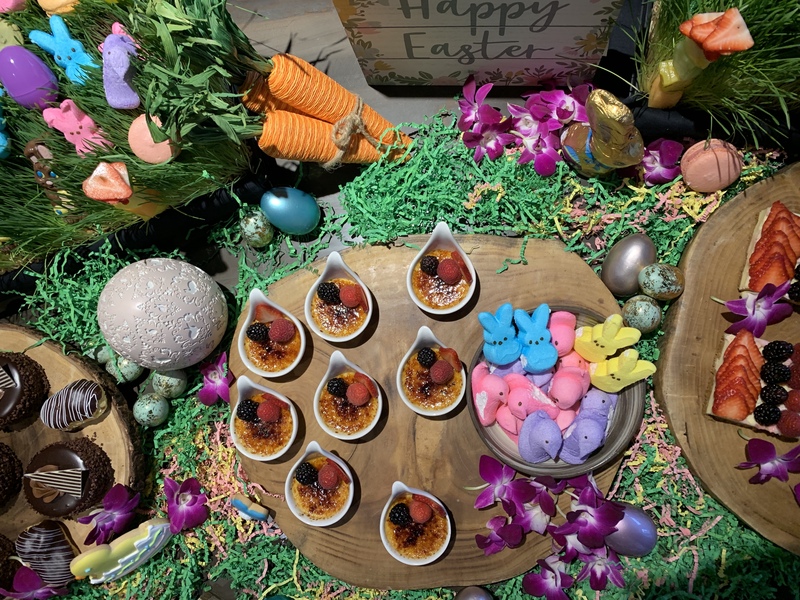 If commuting into the city is not in your Easter plans, The Hyatt Lodge in Oak Brook (2815 Jorie Blvd, Oak Brook) will hold Easter Brunch between 10 a.m.-2 p.m.on Sunday. The brunch buffet will feature a kids buffet, carving stations and seafood and sushi. Guests can also look forward to magicians, a piano player, and an Easter Bunny appearance. Brunch is $67 per adult, $57 per senior, $26 per child (ages 5-12) and free for kids under 4. Reservations can be made by calling the hotel. The special Chef Table will feature a breakfast station, salads, hand-carved roasts, delightful sides, desserts, and more. On Sunday, April 21, Hubbard Inn will host a $50 Easter Bottomless Brunch from 11 a.m. to 3 p.m. featuring a choice of mimosas or bloody marys paired with a brunch buffet. Created by Executive Chef Jason Hedin, the buffet will be stocked with baked goods, a waffle station, an omelette station, a carving station, fresh fruit, bacon, sausage, ham and more. Reservations are available through OpenTable at www.hubbardinn.com/reservations. Saturday, April 20 and Sunday, April 21 from 11 a.m. to 3 p.m.
Parlay at Joy District invites Chicagoans to their Easter weekend brunch buffet, available from 11 a.m. to 3 p.m. For $50 per person, guests will enjoy a brunch buffet and mimosa bar. Created by Executive Chef Jason Hedin, brunch highlights include a carving station, seafood table and charcuterie, chili and pizza bar, waffle station, egg station, and dessert selections like cake pops, tartlets, brownies and a variety of Rice Krispie treats from Fruity Pebbles to Lucky Charms. There is also a cereal bar and a donut wall with flavors like powdered sugar, sprinkles, chocolate and vanilla. For reservations, visit https://www.parlaychi.com/reservations/. Sunday, April 21 from 11 a.m. to 9 p.m.
Tuscany Restaurant on Taylor Street will feature an a la carte Easter specials menu created by Executive Chef Victorio Padilla. The regular menu will also be available, and specials will include items like Burratina ($12) with roasted beet, pesto and a grilled baguette, Gnocchi Ragu D'Agnello ($22) with lamb, tomatoes, red wine and pecorino, Speck Eggs and Pizza ($17) with mascarpone cream sauce, fontina over-easy eggs, and arugula, Bistecca con Ouva ($29) with entrecote steak, eggs cooked to order, roasted potato and chive butter, and more. Complete specials menu available on request. Sunday, April 21 from 9:30 a.m. to 4 p.m.
Tuscany in Wheeling will host an Easter Sunday brunch buffet with a variety of stations created by Executive Chef Bolla Loza. Food stations will include breakfast, seafood, carving, omelet, Italian, salad, antipasto, seafood and dessert. There will also be a special kids station. A dinner menu will be available from 4 p.m. to 9 p.m. Reservations are recommended. Spend Easter Sunday with family and friends over a brunch offering: a three-course prix fixe menu, including a Roasted Prime Rib Carving Station. $79 per adult, excludes tax and gratuity. GT Prime will be offering a 3 course, family-style Easter brunch from 9:30am-2:45pm for $55 per person and $25 for kids ages 3-12. Reservation: Reservations can be made on OpenTable or over the phone. 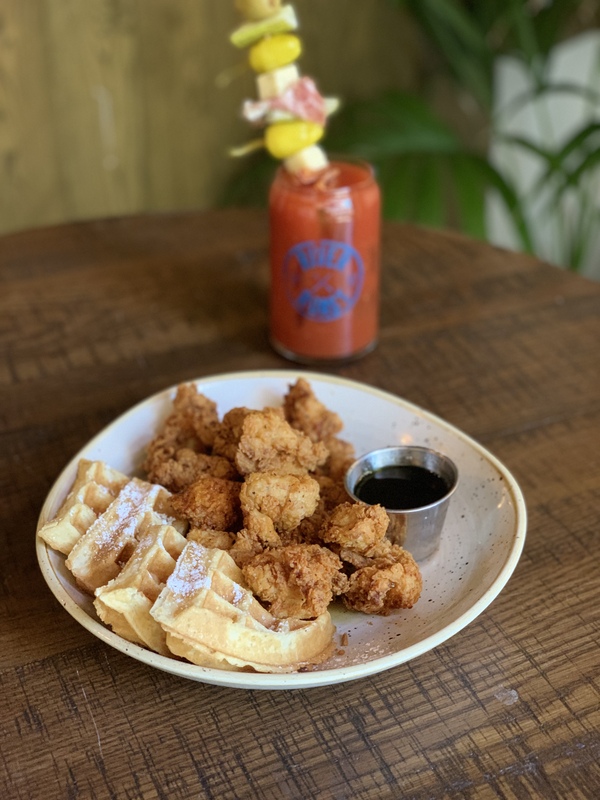 GT Fish & Oyster will be offering a family style menu from 9:30am - 3:00 pm for $55 per person, guests ages 4-12 pay $25 and kids under 3 eat free. Tickets / Reservation: Reservations can be made on OpenTable or over the phone. Treat the family to a family style brunch at Swift & Sons this year, available from 10am- 2:45pm for $58 per person, kids under 12 eat free. Celebrate Easter at Roka Akor with their special lunch menu. Menu highlights include: Grilled Pork Belly with tarragon miso and pickled radish; Grilled Salmon Teriyaki with pickled cucumbers; Snake River Farms Wagyu Sirloin with soy butter and mushrooms; Deviled Eggs with yuzu and shiso; Ube Pot de Creme with fresh berries and bubu tuile; plus more. Lunch is available from 11:30am - 3pm for $38 per person. Celebrate Easter at Roka Akor and their three-course brunch menu featuring: "Karaage" Japanese Fried Chicken with sweet chili aioli; Robata Grilled Prime Skirt Steak with sweet garlic soy, ginger shallot broccolini and rice; brunch cocktails; and more. Brunch is available from 11:30am - 3:30pm and is $32 per person. Chef Tony Mantuano and Executive Chef Joe Flamm have created a special brunch menu inspired by the flavors and traditions of Sardinia. Menu highlights include Lamb Saddles with pave, pea shoots, and fresh pea salad; Salmon with fennel, roe, and ramps; Olive Oil Cake with Chantilly and berries; and more! The Sardinian Easter Brunch is available from 11am - 2:30pm and is $65 per guest.